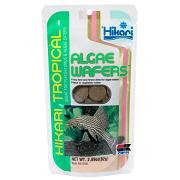 One of the secrets to having healthy and active aquarium fish is to feed them at regular intervals with the right amount and mixture of nutritious and well-balanced diet. It is always a good idea not to stick to a single brand or maintain only dried processed food throughout the whole year because basically fish, just like humans get all their nutritional contents from different source including live foods as well. One particular feed maybe lacking in certain components but combination of different fish foods will ensure none of the important components will be missing. 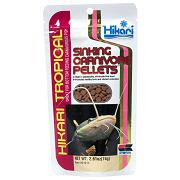 With today’s advancement in food processing technology, different varieties of fish food are readily available in stores or even online and they come in different packaging and solid forms like pellets, sticks, and flakes. With the wide variety and selection in different brand names, how do you know you are getting the right food for you fish? Of course you might aim for brand names because basically the most trusted ones should be the most reliable. However, as a responsible owner, you could also take some effort to do your own research. Just flip over to the pack and check for the nutritional content listing and compare among the brands to decide yourself. Basically based on my own personal experience, try to look for the fish food with highest amount of protein (in the range of 46-60%), fat and fibre (combination of both should be in the region of 3 – 6%) while at the same time having the lowest moisture or ash content (less than 10%). 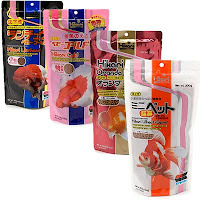 There are also certain brands, which contain ingredients tailor-made specially for growth, color enhancement, while others concentrate on easy digestion (most important for goldfish), so will be up to you to make up your mind on it. Another thing you should note is that never ever purchase in bulk. This is the most common mistake always made by a pet owner who thinks that buying in bulk can help lower the cost. This is actually not true because the person will actually end up losing more in the long run. Bear in mind that dried and processed foods have a limited shelf-life and generally they are best use within a certain period of time because sensitive ingredients like vitamins and proteins are prone to oxidation and the level will decrease gradually. 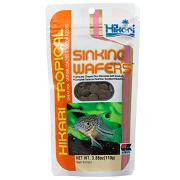 So finally if you notice that the color of your fish has started to fade or your fish has becomes less active or are easily prone to fish disease, first ask yourself are you feeding the right type of food for your pet?